This report highlights on media coverage of oil deal which been signed last year between federal government and Kurdistan Regional Government. The monitoring report has tracked the path and the various orientations of media coverage over the agreement, for 'Arabs & Kurds' sides, which lasted for around seven months, through previewing the professional in news reporting handling, according to neutrality standards, and the ability of providing proven information to audience, as well as monitoring both implicit and direct 'incitement' of the coverage, on the side-line of prosecuting developments in the agreement's implementation. In the beginning of November 2014 negotiations were held between federal government and Kurdistan government, led by the Ministry of Oil on behalf of Baghdad and the Ministry of Natural Resources on the Kurdish side. The Oil Ministry announced on the 14th of November 2014 in an official statement, that, 'as an implementation of paragraph 17 of the governmental order, which requires resolving the outstanding dissensions between the federal government and the Kurdistan Regional Government in both two dossiers 'Arbitrage and Oil export' , it was agreed with our partners in the provincial government on starting the first steps to rebuild confidence and resolve dissensions comprehensively, just, and constitutional'; The statement said that 'the agreement whereby the federal government transfers $ 500 million to the provincial government, while provincial government put 150 000 barrels of crude oil per day at the disposal of the Federal Government’. On December the 2'nd / 2014 the government declared in an official statement, 'The Council of Ministers approved the oil agreement between the federal government and Kurdistan regional government, which provides for the delivery of Kurdistan region of at least 250 000 barrels of oil per day to the federal government for export purpose’, as well About 300 000 barrels per day from Kirkuk oilfields issued by region pipelines; On the same day the United Nations Mission in Iraq welcomed the agreement between the governments of Baghdad and Erbil on the export of oil and the arbitrage, as well as the United States, Turkey and European countries. On the 15th of February 2015 signs of a dispute between Baghdad and Erbil have started to take a formalized style, and was preceded weeks before by Inaccurate leaked news, lacking specialist officials’ comments about the disagreements. On 22 February 2015 the Federal Ministry of Finance announced on sending 250 trillion Iraqi dinars to Kurdistan region, as a move considered by Arab and Kurd deputies as a save to the oil agreement signed between Baghdad and Erbil. On 21st of March /2015 the Ministry of Finance in Kurdistan region announced that it will receive $ 250 trillion Iraqi dinars from Baghdad, and it will be paid as salaries, but they did not explain the reason behind sending that amount and based on what. In the early days of the agreement announcement between Oil Ministry and Ministry of Natural Resources in Kurdistan region the majority of media covered the news based on official data published by relevant institutions without investigating technical details. The media published the supportive and opposition comments of the agreement, of deputies and officials, from a political point of view without documenting those statements with supportive information and figures. The majority of media did not pay attention to data released by Federal Ministry of Oil, which announces a monthly volume of exported oil amount from all producing fields in Basra, Kirkuk, and Kurdistan regions, and their financial revenues; the media published this data without analysing and follow-up by specialists, while some media published the announcement as reported by ministry without editing. Some media published statements 'as major headlines' of MPs demanding official authorities to disclose amount of oil exported from the province of Kurdistan, while those numbers are already available in Ministry of Oil website. Some media quoted several non-documented stories about the reasons of the deterioration of oil agreement, through press reports accusing the Kurdish side not to fulfil its commitment to export the specified quantities of oil, which prompted the federal government to stop sending money to them, while other media mirrored the story that federal government did not send the financial dues to Kurdistan region, which prompted Kurds to the non-fulfilment in producing the amount of oil they binding by it. Several media published headlines referring to 'close collapse' of the oil agreement between Baghdad and Erbil without documented facts or numbers and evidence, based on comments by deputies and officials who did not disclose data and statistics to support their views. The majority of media has failed to follow up the news of agreement and its implementation steps, they merely had focused on public statements of deputies who talked about accusations and criticism without figures and data. Majority of media failed to clarify the agreement and its implementation mechanisms to public opinion, for example failure to clarify the reasons behind receiving Kurdistan region $ 500 000 dollar and Kurdistan region's commitment to exporting 550 000 barrels per day in return; that amount was supposed to be accrued salaries to the staff of the province, while the media had classified that amount as money with no pay tab. as it was observed a weakness in economic coverage in terms of analysis by auditing and discussing from an economic standpoint, a lack of data, figures, and tables, and shortcut the media coverage through comments of officials or economists who criticized or welcomed the agreement. Some media merely relied on statements of non-explicit sources that sparked confusion and controversy over oil deal, without obtaining comments from officials at Ministry of oil in Baghdad or Kurdistan Regional Government on this matter. Monitoring included Arabic-speaking media that is published in Kurdistan region. Kurdish media has published news on the oil agreement since the initial talks in November, and chased it with intense coverage until signing the agreement on the 2nd of December 2014. In mid-February after signing the agreement some differences in interpretation of agreement have occurred, then after some Kurdish media tried to describe those differences as ‘Conflict’ between the two parties, or ‘Trick’ by Baghdad. Kurdish media remarkably adopted the standpoint of Kurdistan Regional Government, while neglected the information or standpoints of the other party in Baghdad, especially talking about a mutual commitment to the terms of agreement. Some Kurdish media proceeded to create a public opinion against Iraqi government about the agreement, through publishing corners of opinion corners that indicated the agreement as a "waiver by the province to central government. Kurdish media focused on what they called 'Regional Government commitment to codes of agreement' and they justified the 'non-compliance' without information, merely some paragraphs of the agreement by regional government. Majority of Kurdish media refrained from covering the viewpoints of the parties on the agreement, where neglected to a large extent following up the technical and political attitudes in Baghdad, and preferred to publish all that relates to the Kurdish side, except some extremely rare cases, as in 'Rudaw' channel, website, which published separate interviews, one with the oil minister in federal government ' Adel Abdul-Mahdi' and another one with the Minister of Natural Resources in Kurdistan Regional Government. 'Al Iraq Al Youm' newspaper issued sharp titled reports which could be classified as nationalist incitement such as: [Kurdistan declares that it will swallow .. sorry 'retain' oil returns before its agreement with Baghdad], [Barzani's remarks suffer from otitis media], and so on; all titles were followed by implicit directing to reader toward adopting hostile viewpoints against Kurdistan region, as well as some subtitles like those who were in the same newspaper 'Al Iraq Al Youm', that published the statement [issued by a group of Iraqi oil experts concerning oil agreement and included positive and negative points] as a detailed report, giving each paragraph an incitement title, such as [the agreement destroys Iraq and Coquet Kurdistan]. '"Mustaqbal Al Iraq' newspaper published series of reports in which quoted from sources, 'close to government', their dismay of Kurdish policy, like the report titled, [region harasses 'Baghdad' through separation cacophony tone], which prejudiced on Kurdish politicians, accused them of extortion in cooperation with Sunni politicians, what threatens national unity; In another report the newspaper linked between the problems revolving around the export of oil and ongoing war with ISIS; also through another report related to the oil agreement the newspaper quoted a parliamentary source his demand to the prime minister to reconsider the unfair agreement which leads to distinction between people classes and components of people, what might cause an outbreak of popular anger in the Iraqi. Some of 'Arabic-speaking' Kurdish media which were covered by IMH monitoring report, including "Rudaw, Bass News, KNN, PUK Media, Khandan, Pyamir", had published materials between reports and opinion articles which adopted formulations that led to link the dispute over oil deal with 'hostility to Kurds and Kurdistan', also political standpoints emerged and proceeded in turn to national referrals. Mostly, media coverage in both Arab and Kurdish sides failed in providing documented and proven information on the implementation mechanisms of oil agreement between Baghdad and Erbil, this failure varied by weakness of information sources and what can be described as 'intentionality' to conceal a part of the facts. Majority of media found it easy to broadcast accusatory standpoints by both parties of the agreement against each other without invoking evidences and facts. Part of coverage shifted to an opportunity to feed nationalist intolerance between Arabs and Kurds, what seemingly came from the exploitation of political parties to media for such purpose. Voices of experts and technicians in field of oil almost was absent from the media coverage of agreement. The absence of neutral journalistic investigative materials over the agreement, from the overall coverage, while it was rare to hold interviews with officials concerned on agreement dossier in both Erbil and Baghdad. Majority of press articles that dealt with the oil agreement could be described as ‘Lame', for the excessive reliance on a single source represented specific viewpoint. For taking precesion in account, the monitoring report didn't cover Kurdish-speaking media, merely the Arabic-speaking, and it could be noted that the nature of publications varies from Kurdish to Arabic into media that own Arabic versions. 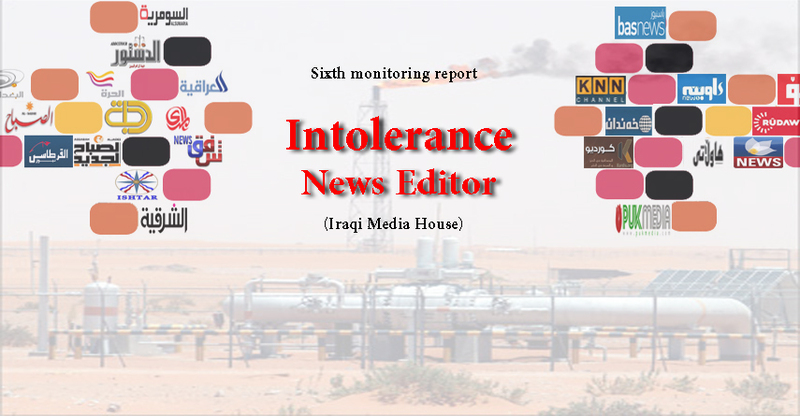 Our sixth monitoring report reconfirms previous data, that the IMH has referred to at the beginning of March last year, about the lack of specialization on economic journalism in Iraq; today media coverage of oil agreement confirms this point through series of press articles that missed by the scientific understanding to economic data which must be provided in journalistic reporting.